A crucial element to branding and brand personality, that is most often overlooked, is your font. A font, which is considered “typography” in the design world, holds a lot of weight on the overall feel of a brand. The design of letters (fonts), can be a huge impact on the feeling, voice, and message of your brand. The “type,” short for typography, you choose sets a mood & atmosphere. Type expresses identity and sends subliminal messages to the viewer on the reliability and overall feel of your company. The most important rule you can follow is that the font you choose for your brand must not only be legible, but readable. This probably seems pretty obvious, but there are many companies that seem to miss this crucial detail. The harder it is for your customers to decipher your message or words, the less likely they connect with your brand. Legible, does not necessarily mean readable. The legibility of a font is based off of it’s design, and how easy you can distinguish one character from another. You want to use a font that has letters that are easy to comprehend. Readability is based off of how the letters in the word appear. The width between lines of text or the characters in relation to one another affect the readability of the words. These two components go hand-in-hand and are imperative to the comprehension of the information your brand wants to communicate. Who would have thought that the way letters look could so greatly affect one’s perception of the content at hand? Since typography can set the tone for your content, it is important to be aware of this when choosing fonts. Here’s a break down of a few key font types and what they can mean for your brand. A Serif type was the first typeface ever created. Serif typefaces have a small tag or tail at the end of each stroke. Because of these smaller identifiers, serif type has been found to be more readable in large bodies of text and at a smaller size. The tags add contrast and make it easier for the viewer to differentiate one character from the next, also making these fonts more legible. Since serif type has been around for so long, it is more of a universal, safe font option, in terms of personality & character. Serifs are more mature and give off a more sophisticated look. Now that you know what a serif is, let’s look at a sans serif. Sans (without) serif fonts are a more modern and up-to date option. These fonts do not have the small tag or tail that serifs do. They are harder to read in printed text but work better than serif’s online. The default font in google docs is arial, a classic, commonly used sans serif. These fonts work well in headlines, as they are straightforward and easy to read at a large size. In comparison to serif fonts, sans serifs bring a more contemporary and modern feel. They have become widely used more recently for more minimal designs. The more decorative category of fonts, a script font, often contain swirls and flourishes. These fonts are often used for headers & large text and would rarely, if ever, be used for paragraphs of text. Being decorative, these are often less readable and used in select circumstances. Often used as in a wordmark logo, such as Disney. Script fonts in essence, are an extension of handwriting, inspired by the way we really write. Because of this, these fonts are seen as more friendly and personable or relatable to consumers. Cursive fonts also bring about a feeling of elegance and lean more toward femininity. Slab serifs are a different version of serifs, with blockier tabs at the ends of each stroke. These are easy to spot and easy to remember by their distinct look and relation to their name. Slab serifs, are directly named after their slabs. These have been seen as both headline text and body copy. Slab serifs are often seen as reliable, steadfast, and sturdy due to their strong slab end points. These typefaces bring about a grounded feeling and something you can rely on. These fonts are still seen as personable and friendly even with their solid nature. 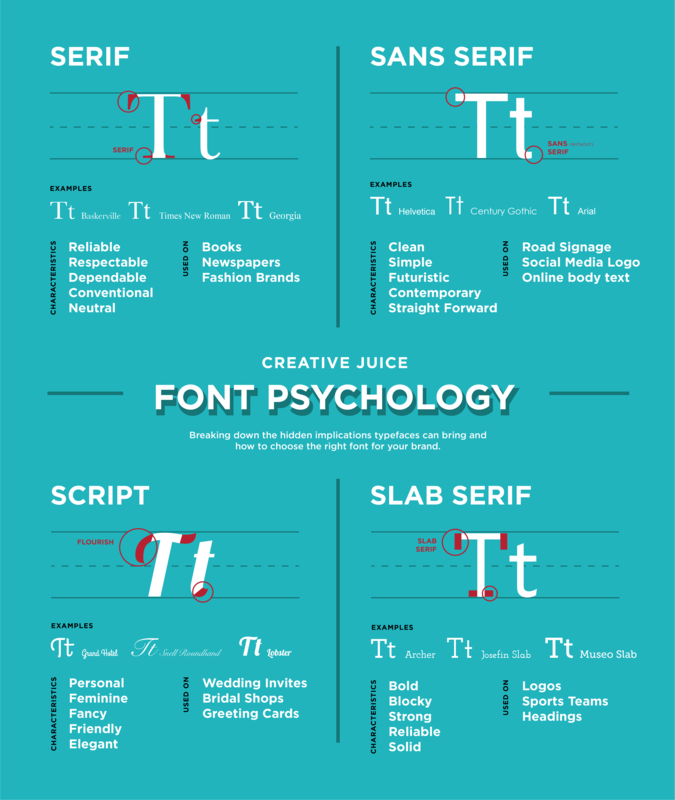 Choosing a font can be overwhelming, so we’ve created a cheat sheet for you. These different categories are just a few of the many different fonts options you can choose for your brand. 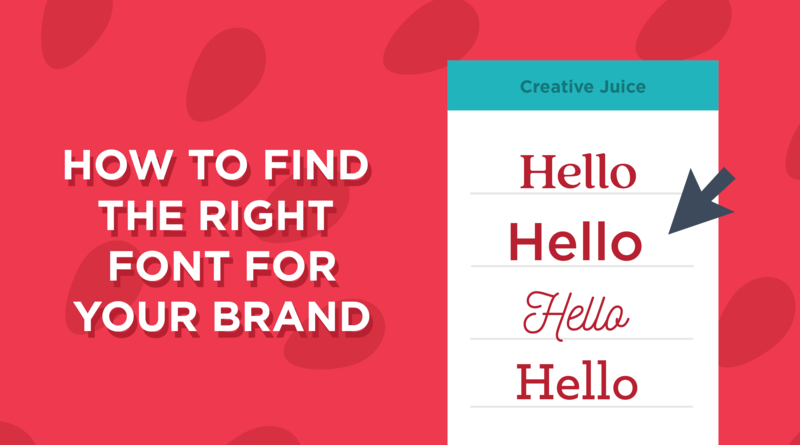 By choosing the right fonts, you can give customers an idea of which type of brand you are. Having a unique font and using it consistently builds a familiarity with customers and also makes your brand stand out in their mind. Fonts are vital in conveying the personality and emotion of a brand. Though something simple like the font you choose for your brand may seem insignificant, it is important that you spend some time thinking through your brand voice and personality so that you make the right decision. There’s thousands of fonts you can choose from, with some businesses even creating their own custom font. If you are looking to find the perfect font, our Juicers can help. Contact us today to schedule a free consultation.